Campgrounds like Thousand Island Park were part of a religious revival that swept the United States in the 19th century. The campgrounds grew out of the revival meetings that were a feature of the Second Great Awakening, which, among other things was pro-temperance and anti-slavery. Of all of the various denominations involved in this evangelical movement, Methodists sustained camp meetings for the longest period of time. The early camp meetings, such as Wesleyan Grove on Martha’s Vineyard which began in 1835, were intense and serious spiritual experiences. Taking place in open air locations of beauty and tranquility, they could last as long as a week. The days were full of prayers, lectures, and hymn-singing. Initially, only adults attended. The woodland settings, rustic communal tents and dining, and spontaneous religious activities were intended to allow participants to communicate directly with God. As campgrounds grew in size and number, they became permanent summer communities. Participation became a family affair. Communal tents sponsored by church societies were replaced by individual family tents and eventually permanent, usually frame dwellings. While the first houses resembled tents, they soon developed into larger cottages. Over time, campgrounds became places of recreation as well as religion and were seen not only as places for the seriously devout to worship, but also as resorts where families could come for a spiritually and physically healthy vacation. It was in this phase of campground development that TI Park has its roots. Led by John Dayan, a former Methodist circuit rider, the park was dedicated in 1875, when most campgrounds had passed through the initial, more primitive period and had become permanent, seasonal communities. In addition and more broadly, industrialization was changing society in many ways, including the development of a middle class, which was able to actually take vacations and leave crowded cities using the new transportation systems that were built during and following the Civil War. What follows is a brief history of Thousand Island Park, located on Wellesley Island in the St. Lawrence River. A more detailed history may be found in Thousand Island Park: One Hundred Years and Then Some (Jacox and Kleinhans) available in the TI Park library and the Thousand Island Park Landmark Society resource center. 1874: After a few years of attempted planning for a campground on Wellesley Island, the organizing committee decided to proceed with development on the current TI Park site. The Thousand Island Park Camp Meeting Association (later changed to the Thousand Island Park Association) was incorporated in September, with nine trustees who served “with no particular privileges and no compensation or pecuniary process.” One of the campground’s specific purposes was the encouragement of cross-border activities. 1875: Land assembly, purchase, and site development continued. All of the lots marked for sale on June 9 were sold in 24 hours. Disappointed would-be purchasers were promised another sale soon. The park dedication on July 21 ushered in two weeks of daily (often multiple) religious events, presentations by guest preachers, organizational meetings and spontaneous individual prayer sessions. Campground lectures topics often included temperance or the emancipation of slaves. 1876: TI Park acquired its first postmaster. 1877: Residents were moving quickly from tents to houses. Between four and five hundred lots had been built on, and cottages were increasing at the rate of 50 per year. TI Park benefitted from the continued development of the Thousand Islands as a resort area, which started with President Grant’s visit in 1872.
the hotel, re-named the Columbian, was rebuilt on its former site - new and improved. the Columbian was rebuilt on its former site — new and improved. Fire prevention measures included a brick kitchen and steel ceilings in public areas. In its first 15 years, Thousand Island Park changed from a little campground in the woods to an expanding summer resort on the river. By 1890, infrastructure had developed to meet the needs of the growing number of cottages and residents. The Park boasted the Columbian hotel, the Tabernacle, the Main Dock and pavilion, bridges across South Bay and the swimming cove to reach the lots situated on the other side of either bay, a larger post office, a telegraph system, gas lights along the main streets, a new and enlarged general store, a new dining hall, a chapel, a museum, and new recreation facilities such as a riding stable, a roller rink, tennis courts, and croquet grounds. Between 1885 and 1887, the Camp Meeting Association installed water, sewage, and drainage systems and organized a local board of health. This was followed in 1887 by the first municipal-style code covering health and safety matters such as clean water, garbage collection, and the storage and sale of food. 1884: a wooden Tabernacle replaced the large tent that had served the purpose. The Association expanded the number of lots, some on existing parkland, to fund the construction of the new tabernacle. 1885: for the first time, the Association sold shares to people not connected to the Methodist Church. Debate continued regarding the “tone” of the park, especially on the Sabbath. Despite pressure to loosen rules, during the hours not spent at religious services, swimming and boating were not allowed on Sunday although strolling along the river was permitted. Boats from the mainland we not allowed to dock unless the passengers were disembarking to attend church. During this period, the price of lots increased. In some cases, the selling price increased tenfold since the park was established. 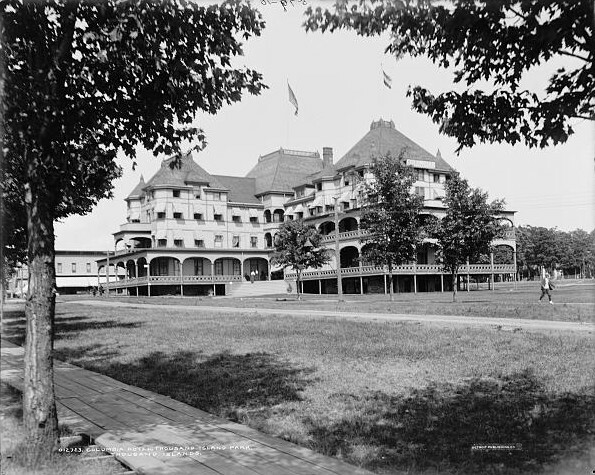 On August 21, 1890, the Thousand Island Park Hotel burned to the ground in 45 minutes. Although lack of hoses and water supply hampered efforts, bucket brigades from the river limited damage to 13 buildings in close proximity to the hotel. There was one fatality. 1892: the hotel, re-named the Columbian, was rebuilt on its former site — new and improved. Fire prevention measures included a brick kitchen and steel ceilings in public areas. 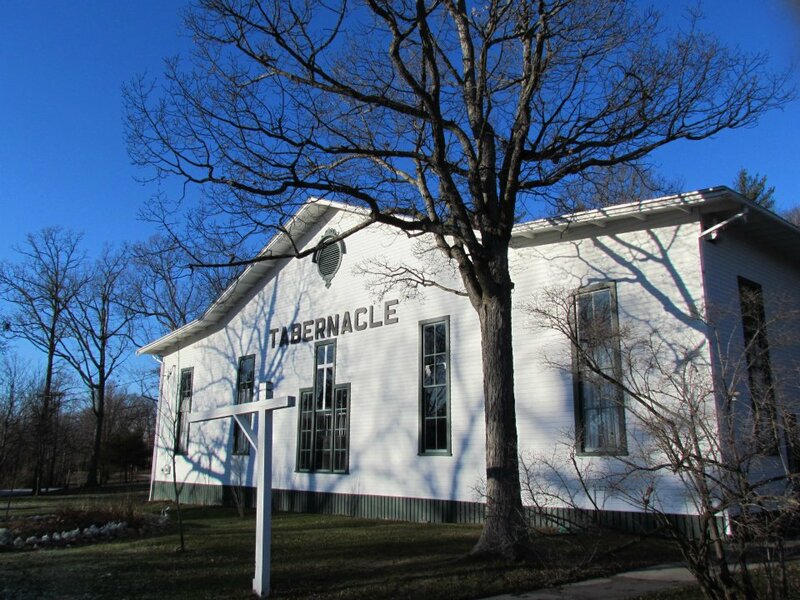 The same year, electricity came to TI Park with the construction of an electric plant large enough to light the new hotel and grounds, the Tabernacle, the chapel, and any private cottages where owners wanted to sign on. Lighting that did not involve an open flame was a huge advance in fire prevention for a community full of wooden, painted buildings. 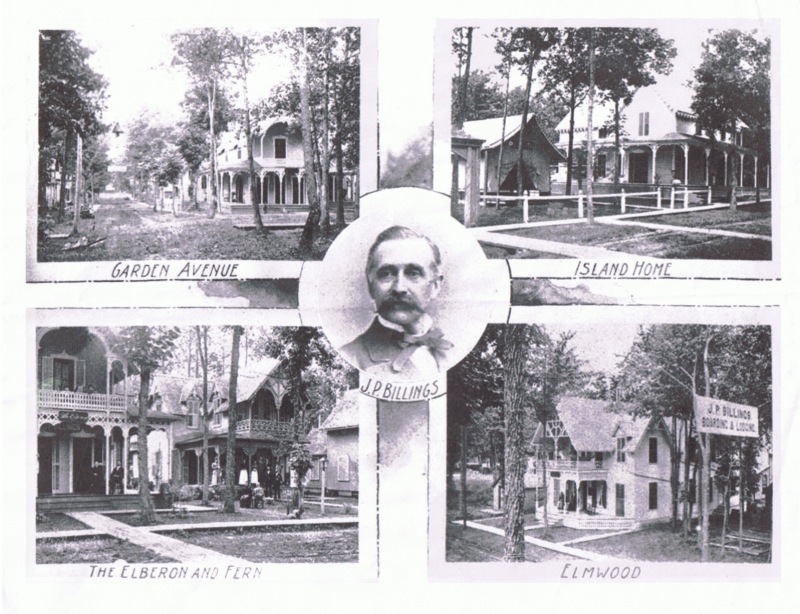 1894: well over 500 cottages had been built on TI Park. There is no evidence that the number ever exceeded the 600 mark. There were as many as 7,000 people were in the Park on a summer day. Throughout the 1890’s, the program of “instructive exercises” expanded to include interesting and timely speakers (Frances Willard, Carrie Nation) as well as cultural events (a South African Native Choir and The Syracuse University Glee Club). Organizations such as the Grangers had conventions in the park. 1895: Swami Vivekananda rested at TI Park for seven weeks after two-year tour of the US following his address in 1993 to the World Parliament of Religions. He stayed in a cottage situated above the Tabernacle along the nature trail. 1903: The library, funded by Mrs. E.R. Holden, a member of the family that donated generously to TI Park, was built to enhance the park’s learning and cultural environment. The same year, the TI Park Association opened the Wellesley Hotel at the corner of Rainbow and St. Lawrence avenues to alleviate the pressure for increased summer accommodation. 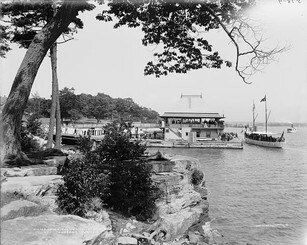 The continued popularity of the Thousand Islands as a vacation spot meant increased development, more people, and more fires. The fire fighting technology of the day did not seem to be equal to larger numbers of mainly wooden summer structures, many on islands. 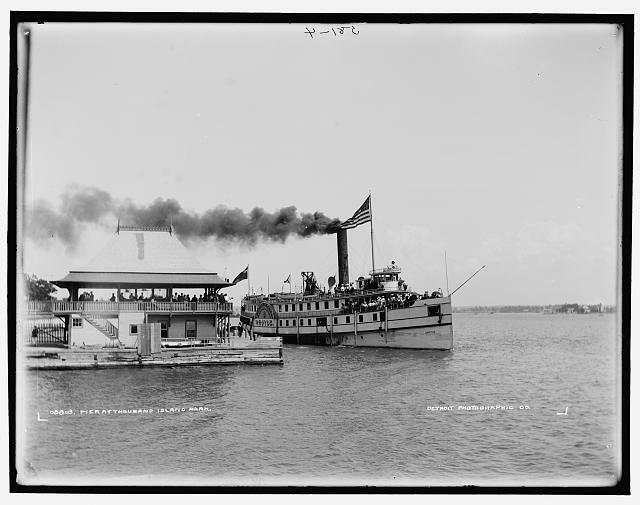 In August of 1911, the Frontenac Hotel on Round Island burned down. The next spring, five cottages on Grenell Island were destroyed by fire. Shortly after, fire leveled a boat shop and nine boathouses in TI Park. This was followed in June by the destruction of four homes, including “Pansy Cottage.” In late June, the Association and cottage owners initiated plans to upgrade the park’s fire protection. There was no volunteer fire department. July 9, 1912: The planning for better fire protection came too late. At 1:00 PM, a fire started in the second Columbian Hotel. 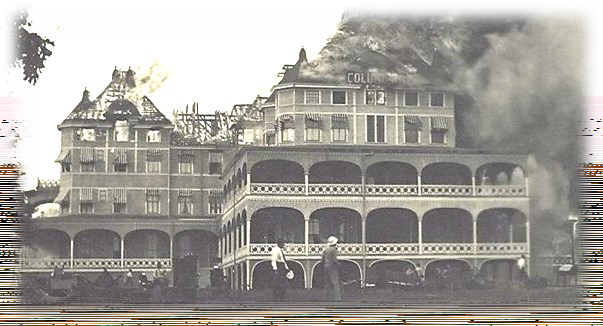 Unlike the last Columbian fire, when wider fire damage was limited, a combination of hot, dry weather, insufficient water and equipment, and wooden sidewalks which acted as fuses, resulted in the destruction of the hotel, seven business buildings, three schools, the chapel and 98 cottages. Five hundred people were left homeless. 1913: Recovery began with construction of a cement-block “fireproof” building at St. Lawrence and Rainbow to replace some of the commercial buildings that burned down. This building, which housed the grocery store and the iconic “Guzzle,” stood at the four corners until August of 2014 when it, too, went down in flames. The current chapel and attached school building, which now houses the TI Park Corporation offices, were also completed in 1913. Plans to replace the Columbian proceeded only fitfully over the next few years due to difficulties raising capital. 1914: Although TI Park survived the fire, the depression of 1913 and the start of World War I signaled the end of the way of life that kept the Thousand Islands alive as a vacationer’s paradise. The Columbian was never replaced and by the time the war ended, the kind of vacationing that supported the big hotels on the river had died. These grand hotels such as the Murray Hill, the Crossmon, and the Thousand Island House fell one by one. 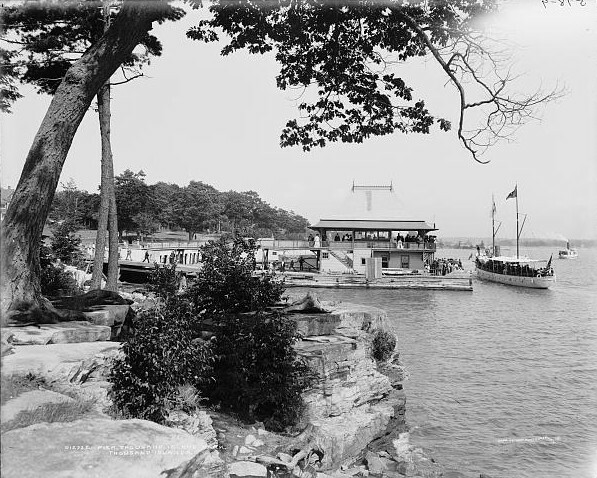 Between the end of World War I in 1918 and the start of the Great Depression, despite the decline of the Thousand Islands region as a tourist destination, Thousand Island Park continued as an active summer community, even as it dealt with such challenges as diminished train service to the north country. The permanent loss of the Columbian provided an opportunity for small hotels like the Geneva, and boarding houses such as the Wren and Rochester cottages, to expand. At the same time, although the TI Park Association still governed the Park and there were three church services a week, TIP was becoming less of a religious experience and more of a resort. This shift in emphasis began as early as 1914, when boats were finally allowed to dock at TI Park on Sunday. 1917: The golf course opened. As happened in broader society, organizations like the Women’s Christian Temperance Union slowly declined while new associations such as a Chamber of Commerce, a Men’s Club, a Women’s Club (with 500 members) and a Red Cross Club emerged on TI Park in the 1920s. Residents could also join a Tourist Club, a Horse Shoe and Checker Club, a Rod and Gun Club, an East Coast Improvement Society, a Library Club, and a Community Bridge Club, to name a few. 1921 : A concert band was in the Park all summer. It played for some religious services, the movies (two nights a week), dances in the Community Hall (also two nights a week) and Tea Dansants two afternoons a week. Musical entertainments and dancing continued to be popular throughout the decade. 1925: The fiftieth anniversary of TI Park was celebrated with great festivity. 1928: A Playground and Recreation Association was formed. The community raised funds for a playground, located on its current site, in 1933-34. By 1929, The Chamber of Commerce, rather than the Camp Meeting Association, was providing most of the promotion to attract vacationers to TI Park. 1933: The amount and variety of summer activity notwithstanding, by June of this year, the Association was in dire financial straits. The lot and service fees were sufficiently low that borrowing had been necessary since 1918 to keep the Park operating. The bonds that had been sold to raise funds were long overdue. Some of the creditors started a foreclosure action. 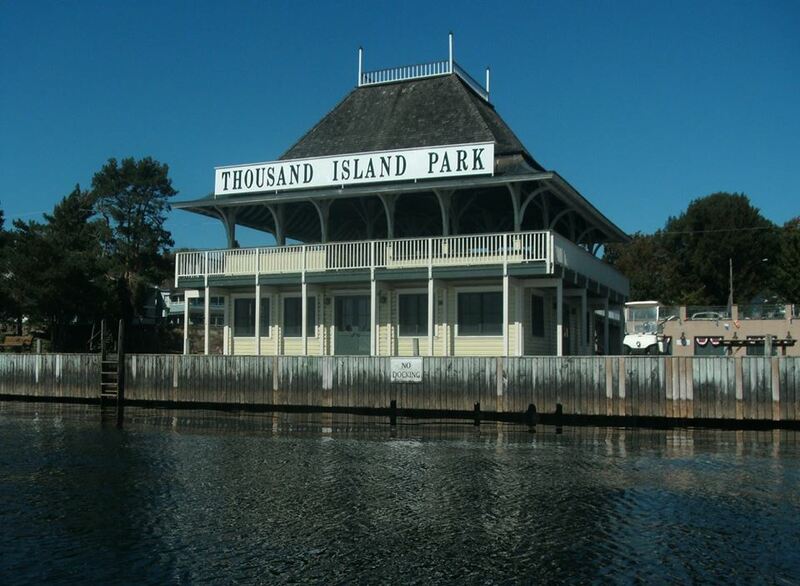 When the legal dust settled, the Thousand Island Park Association was no more, and its property was sold to the recently-organized Wellesley Island Park Inc., whose Board of Directors included TI Park businessmen. Cottage owners who were still owed money from bond sales were given stock in the new corporation. TI Park did not thrive during the disruptive period bookended by the Great Depression and the end of World War II. Between 1932 and 1940, most of the Park’s hotels, including the Wellesley, closed. “Improvements” had become lists of teardowns rather than new cottages and public services. By 1950, there were only 12 businesses and 320 cottages on the Park, down from the close to 600 60 years previously. 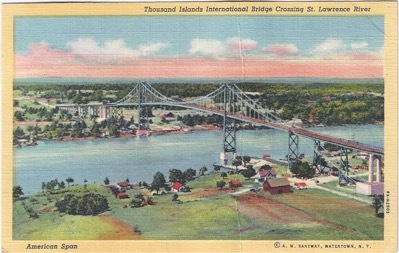 1938: Despite economic hard times and looming war, President Roosevelt and Canadian Prime Minister McKenzie King opened the Thousand Island Bridge. Auto use had increased and drivers were delighted to have a safe alternative to the auto ferries that crossed the river to TI Park. 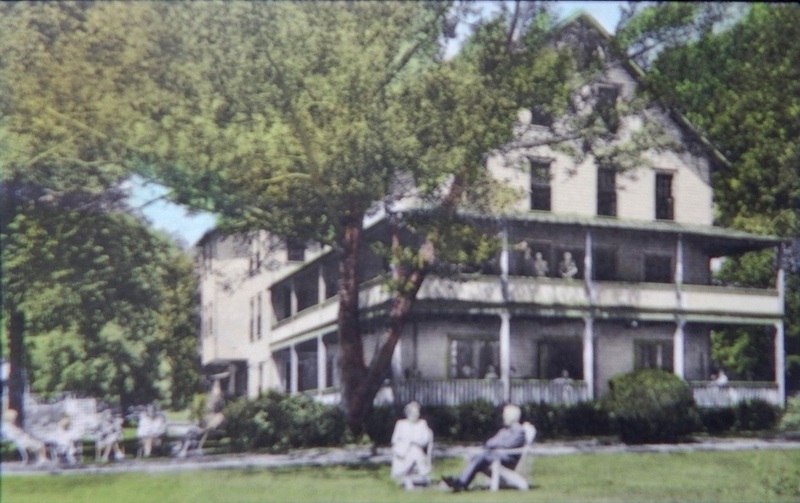 On two occasions during the 1940’s, TI Park entertained groups of wounded soldiers, in one instance providing lodging, meals, trips on the river, and entertainment for a weekend. 1947: Followers of the Swami Vivekananda visited the cottage where he had stayed in 1895. Appalled at the state of disrepair, they purchased the building and named it the Vivekananda Cottage. The Vivekananda Society gives classes in the cottage and it has become a Hindu sacred site. 1948: TI Park emerged from the wartime era much diminished and still deeply in debt. Another stock transfer left one individual a majority stockholder. His proposal to add a $100 special assessment to the increased cottage and services fee of $100, effectively doubling a cottage owner’s annual bill, did not go over well. 1953: The Wellesley Island Park Inc. became the Thousand Island Park Corporation. 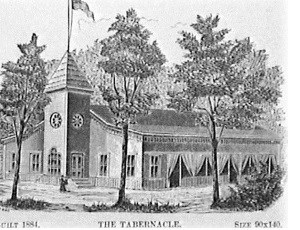 Although Park residents, both Protestant and Catholic, worshiped at the Tabernacle each Sunday, other activities were almost entirely non-religious. 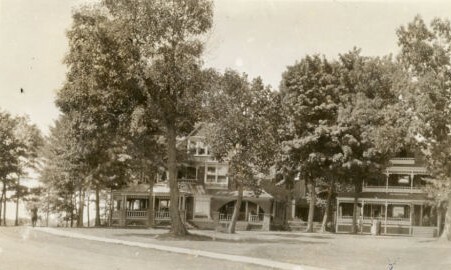 It was still a summer paradise for children who could take part in Tabernacle Committee-sponsored activities like baseball on the green, tennis lessons on the old clay courts, swimming lessons at the cove, story hour at the library, and less organized fishing, swimming, hanging about the playground, and general roaming around on foot or on bikes. Movies were shown at the Tabernacle twice a week. 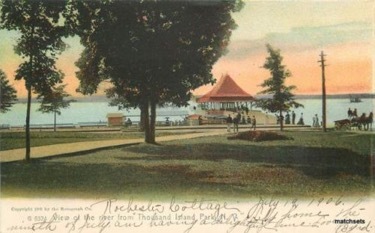 The yacht club and main dock were social centers for teenagers. Adults took part in golf, the Garden Club and the Bridge Club. 1972: The Park stopped dumping raw sewage into the St. Lawrence following the construction of a treatment plant, improving both drinking water and swimming experience. 1975: Thousand Island Park turned 100, no mean feat. The centenary events and the publication of Thousand Island Park: One Hundred Years and Then Some generated new interest in preserving the history and buildings of TIP. 1976: The Thousand Island Park Landmark Society was incorporated as the community-based, not-for-profit organization founded to protect the architectural integrity and history of TI Park. 1982: Thousand Island Park was listed on U.S. National Register of Historic Places. 1983: The Landmark Society organized the first of the bi-annual cottage and garden tours, a major fundraiser to support historic preservation in TI Park. 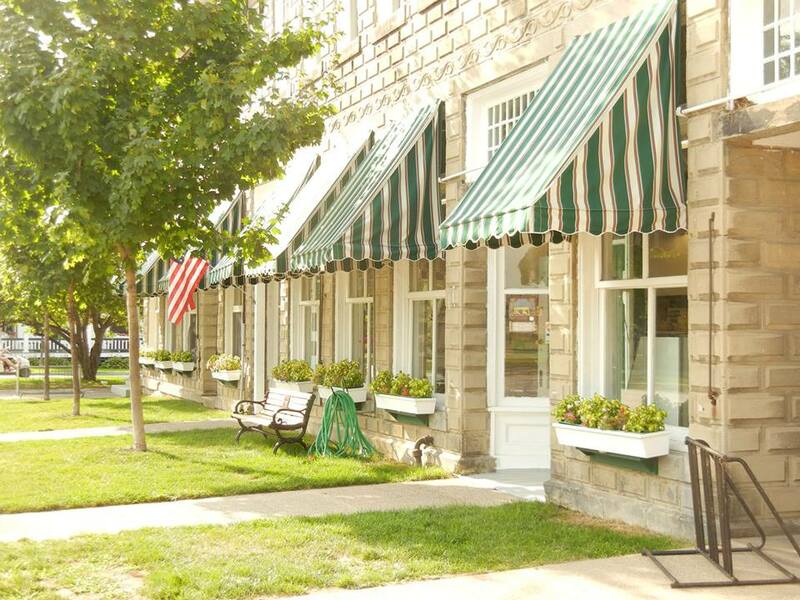 ﻿1987:﻿ TI Park developed and adopted a Preservation Code and established a Preservation Board to guide cottage owners, businesses, and the TI Park Corporation in making historically accurate exterior changes to buildings. 1998: a gazebo was built on the library green. 1995: An interfaith service and dedication of a plaque commemorated the centenary of the Swami Vivekananda’s arrival in Thousand Island Park. 1995-1998: The entire TIP community raised funds to restore the Main Dock to its original design, after decades of neglect. 2000: TI Park celebrated its 125th founding anniversary. 2005: The TIP Corporation and the Landmark Society collaborated to restore the McIntyre Photo Shop. The photo shop, built in 1879 and still on its original site on St. Lawrence Avenue, now houses the TIPLS office, reference library, and shop. 2009: The Landmark Society and the TIP Corporation funded the restoration of the four corners, in the heart of the Park. 2014: The front steps of the library were restored to their original design. The Landmark Society completed the Preservation Handbook, a tool to support historic preservation in TI Park. 2014: For the first time in over 100 years, a catastrophic fire struck TI Park when most of the “fireproof’ building at the four corners, constructed in 1913 after the second Columbian fire, burned to the ground. 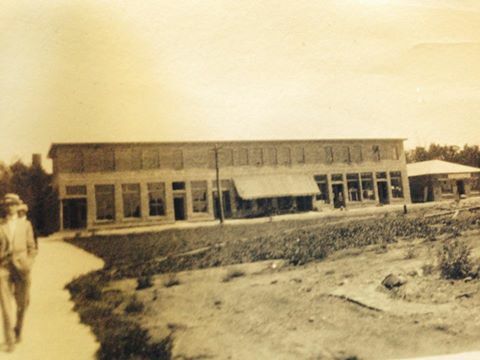 The building contained the “Guzzle”, grocery store, volunteer fire department, a few small shops and offices, a plumbing company, and the post office, which wasn’t completely destroyed. This time, equipment, adequate water, and the skill of eleven local volunteer fire departments kept the fire from spreading to surrounding buildings. There were no injuries or loss of life. After one hundred and forty years, what does the history of Thousand Island Park tell us about this summer community on the St. Lawrence? The 19th-century roots that gave us a place where adults and children could holiday in a place of physical beauty remain strong, as does the communitarian foundation of the Methodist campground. It is also a place of generational longevity. In 1925, when TI Park celebrated its 50th anniversary, a significant number of participants had been in the park for at least 40 years. That hasn’t changed. Now, many residents are fourth and fifth-generation TI Parkers. TI Park is smaller. We have now about forty per cent fewer cottages and many fewer businesses from our peak, largely due to the world-wide economic changes in the 1920s and ‘30s and the slow rebound of the community after World War II. The days of 7,000 people promenading the streets and the river bank on a summer day are no more. Historic preservation is now fundamental to TI Park. The listing on the National Register of Historic Places carries with it an obligation to preserve our irreplaceable architectural history. The Preservation Code has, over the years, guided exterior changes to buildings, including cottages, and full-on restoration projects such as the Main Dock. The beauty of our buildings now matches the beauty of our natural surroundings. The importance of program persists, but with a difference. Originally, the Camp Meeting Association organized formal programs of at least one sermon or lecture a day, generally of a religious nature. Over time, the doctrinal element became less prominent to the point where its now limited to Sunday services, yet our current lectures, reading groups, sports programs, and social clubs are built on the early campground community experience. And TI Park is still a great place for kids. The historic debates about how the Park is financed and governed continue. As in the past, life goes on while the discussions take place. Thousand Island Park has survived two world wars, a major depression, a number of recessions, multiple fires, and occasional questionable financial management. Despite all of this, it continues, sustained by strong communal and familial ties.